Working on your customer base potential is the first step to building reliable financial projections for startups. The revenue model that you choose (which types of customers will be charged, how much, and how) defines how you set up your entire business. 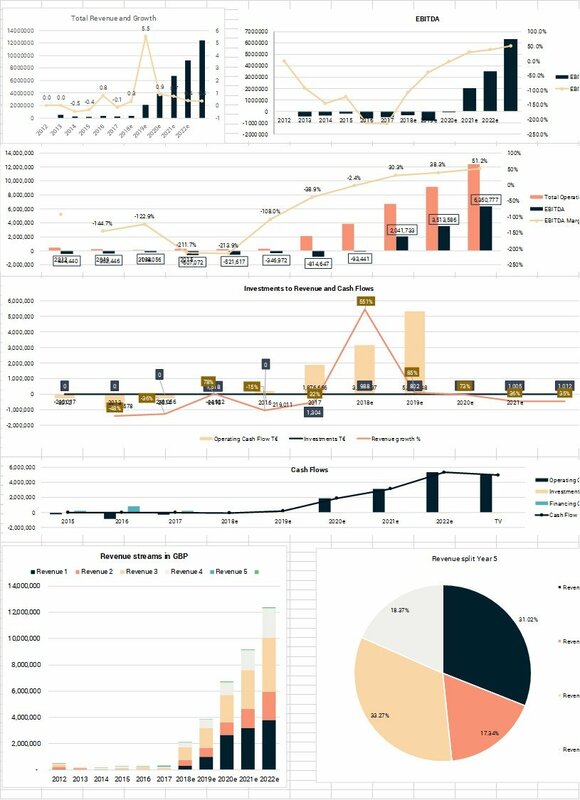 Many startups decide to focus on a fast-growth with technology development and/or customer acquisition and define their revenue model later, but having a set strategy is becoming increasingly important for investors, as proving that you can generate revenue from your customer base becomes part of the validation process. Do you provide repeat or one-off services/ products? By analysing the type of product and the customer base, you should know whether you are selling something that will only be bought once, meaning a churn of 100%, or repeatedly, and if so, how often. Clearly, acquiring customers to sell only one product can make for an unsustainable business model and not likely investable. Determining how often your customers buy a product is not easy, but it is something that you are bound to measure during the typical business operations. It is recommended to project the retention rate or churn within your customers projections, as there may be products that you sell only to new customers (e.g. sign-up fees) and some that you sell repeatedly, and determining what proportion of the customer base is still active helps you plan your operations and allocate budget to retention marketing. Just like you determined how often customers shop, you can also determine the number of products bought or volume each time the customer shops. How you do this, depends on your type of business. If you sell a variety of different products, for example a retailer, you should use volume, while in other cases selecting the number of products (or including this figure in frequency) helps you determine direct costs more easily. The unit price that will flow into the projections should be consistent with any unit used to determine costs. In addition, inflation should be considered, or for many, the point when you start charging the normal price after a fast customer acquisition during market entry. Some retail businesses use a fixed mark-up on the cost of goods sold. After working on your customers projections, you may end up with multiple target customer groups, who are likely to have different purchasing habits, or you may have a product pipeline that each targets different customers to a varying degree. In this case, you can select which portion of each customer group will buy a specific product. Some of these factors are considered for the other revenue streams as well. Licence fees are royalties that you receive for the third-party use of your technology, brand or other IP that you own. Licence fees are typically paid on the wholesale value and based on each end-customer sale. To take into consideration, if the revenue model has not yet been validated, is whether licencing the product to others would prevent you from having other revenue streams connected to the IP, as the licence may be exclusive. For each piece of information collected and modelled into the financial plan, just like we did with inflation, can be changed over time or in steps. Especially for startups, the market entry strategy could differ from the typical revenue generating strategy, and as the market changes, price, number of units, retention and other variables can change as well. As mentioned previously, calculating a retention rate here is fundamental. Calculating an average transaction can be tricky, there is typically a curve of price ranges that is likely to change over time as different customers are targeted and retention increases. You can select a transaction fee in percentage for each different product, or based on the transaction amount that can fall in steps. You can also set this value to be a fixed monetary transaction fee. If you have a platform where users agree on a transaction, both sellers and buyers can be your customers. These can be modelled when calculating customers, but in this case they are typically in a certain proportion e.g. for x sellers there a x buyers, that will of course change over time depending on the platform’s market positioning and success. Therefore, your revenue is dependent on the offer and demand of the products, and they should both be modelled. Each type of subscription model, and any freemium model, are model based on a conversion rate for each subscription type starting from free users. The conversion rate can (and should) increase over time starting from market entry. Each subscription type can have a price per month, period or year, and can even have different prices based on whether the customer pays monthly or in advance. This is not always easy to model into excel. 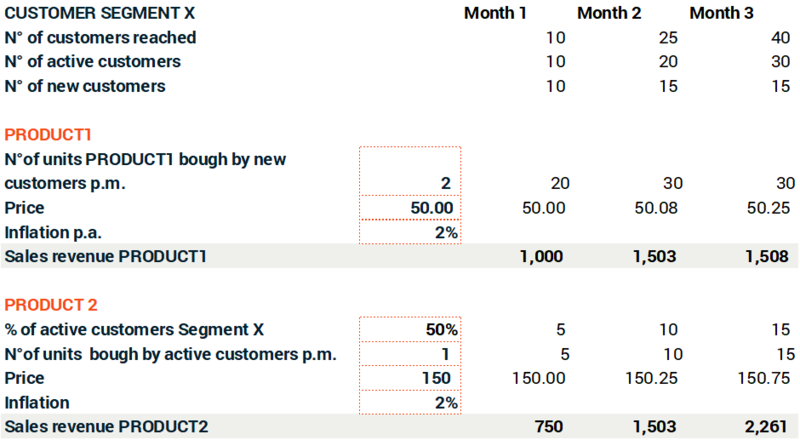 Retention can be considered when projecting customers, but each subscription may also have different lengths and still be paid on a monthly basis. The solution would be to calculate the number of paying users for each subscription per month, or to calculate an average monthly transaction based on the number of customers. Your projections should not be over-complicated: if advertising is only a side-revenue and not important for your business success, you can and should omit it from a financial plan presented to investors, and rather keep the revenue streams straightforward. And how do you calculate direct costs correctly? If you are selling physical goods, this step will be much more complex. First, you may have to carry out revenue adjustments, with warranty returns, resales and discounts. The complexity of this business model when holding inventory, lies in the timing of payments. The inventory is typically paid in instalment, and especially for new companies, in advance. To ensure not to run out of inventory, and funding permitting, inventory levels and corresponding pre-orders should be planned. 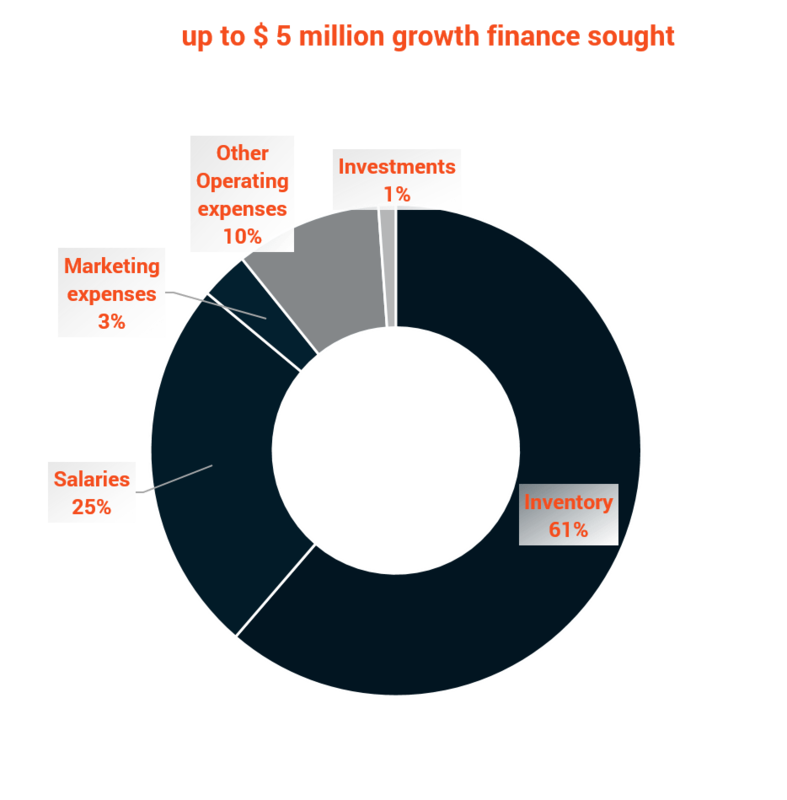 Operating costs can include staff costs, marketing, R&D, Operations and Administration expenses. Employee costs are easily underestimated by startups. Because initially, the ability to earn a high revenue per employee is high, many founders are lead to believe that this value can remain the same or even increase. Instead, a way to measure whether employee costs are realistic, is to gradually drive revenue per employee towards the average of the specific sector. Each employee type or function can be projected based on what their hiring depends on, so for example customer service employees are based on number of customers, other functions might be needed at certain steps or milestones according to the strategy, and other might simply grow with revenue size. Count the employees needed for each function based on capacity – Project the number of employees on a Revenue per employee or Customers per employee basis and compare them with similar industry players: you will be able to determine if your projections are realistic. Sales employees might be more easily projected during the analysis of customers to target. This also applies to marketing costs, that are calculated in advance when validating the market and strategy. Additional marketing costs, however, such as external PR or consultancy agencies, marketing materials and design, regular branding costs or launch expenses, might also be added here. R&D is difficult to estimate in absolute terms, as it can be very industry-specific, but it becomes easier when estimating the number of R&D employees or external researchers involved. Innovative companies are unlikely to have falling R&D costs. Other costs that relate to the company’s operations or the day-to day-administration can be licence fees, hosting fees calculated on a per user basis, recurring product or service costs, product set-up costs, expansion costs, materials and small equipment. If you are delivering physical good, you can separate delivery personnel here, together with shop rent, vehicle leases and fuel, insurance and maintenance, in order to have a good overview of how much operations cost. Administration expenses can include a variety of expenses that slightly grow with revenue or the size of the employee force: Office rent, Utilities, Repair & Maintenance, Security expenses, Business insurance, Memberships, Software, Virtual assistants, Telephone & Internet, Staples, Server costs, Accountancy, Legal, Business consulting, Travel expenses, training, Bank charges and others. Just like we did with revenue, all these costs should be timed, to know example when they will be due. Startups typically have little investments, such as hardware (on a per office employee basis), IP and less investments for real estate or other large physical assets. 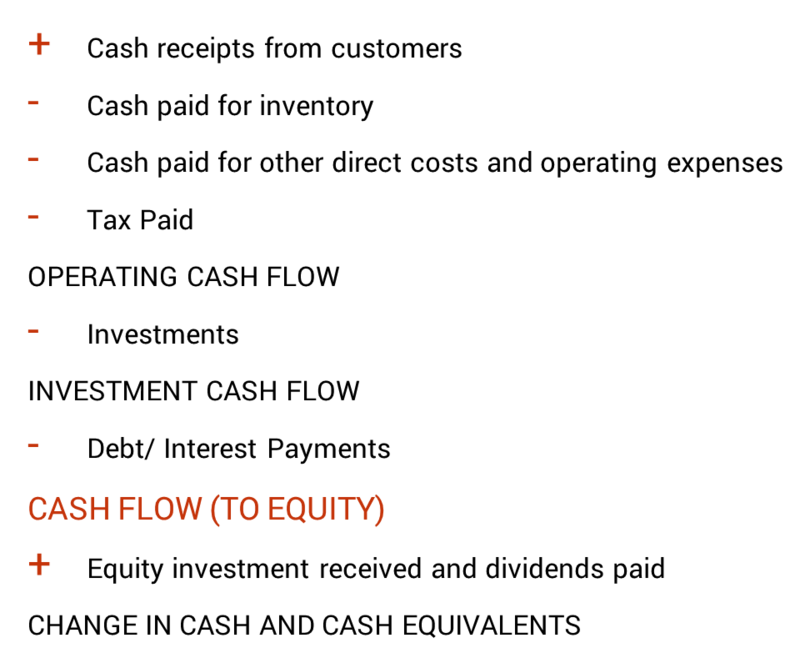 The above cash flow calculations are very simplistic – in a more advance setting or larger fundraising, a complete Profit & Loss Statement, Balance Sheet and Cash Flow forecast is expected. The result of this is the estimate of funds needed. Investors expect to know how much you need, how long it will last, the current Cash Burn Rate and where the investment will flow. Investors want to put their money where value is created, therefore in staff for product development, partly marketing, investments, and inventory depending on its risk. Cash flows also provide information on the time when cash flows are at the lowest point, which is why a plan on a yearly basis may miss this value, and result in companies raising amounts not sufficient to cover liquidity gaps during the year. Once you have this information, you can determine how much you will raise now, and how much you will raise later, taking into account that each fundraising round takes some time. It’s recommended to raise cash to cover negative cashflows over 12-18 months, unless giving away a low stake in the company is a priority, then you can have lower and more frequent fundraisings when possible. Raising enough to cover all negative cash flows is important: to calculate this you can measure all inventory, operating costs and investments cash outflows over the chosen period of time. If you have implemented a realistic strategy and done your research, the cash flows will also give you a rough idea of the total funds needed until an exit takes place.